The ESO Supernova emphasises the importance of enabling all people to visit our centre and to communicate the wonders of astronomy to all. If after reading the below information you have any further questions, please send an email to supernova@eso.org before your visit. If you have any further questions or need support when on site, please do not hesitate to approach one of our staff members or ask at the reception. All areas of the exhibition are accessible for people with reduced mobility, either via ramps or by elevator. The meeting rooms are barrier free as well and there are chairs and benches throughout the exhibition area. A restroom suitable for wheelchair users can be found in the basement. Furthermore our exhibition was specifically designed to be accessible to people in wheelchairs. Please note that the ramps in the exhibition are quite steep in some places. In case of doubt we recommend to take the elevator to the third floor and experience the exhibition from top to bottom. If you need help on the ramps, please contact our staff. The entrance to the planetarium is also barrier-free, but rows 2 - 8 can only be reached via stairs. Please take this into account when booking your seats. People in wheelchairs can also take part in our planetarium shows. We would recommend you to reserve two seats in the first row since the seats are quite narrow and your wheelchair may need some extra space. Our exhibition is largely based on texts and soundless videos, and can therefore easily be visited by people with limited hearing. 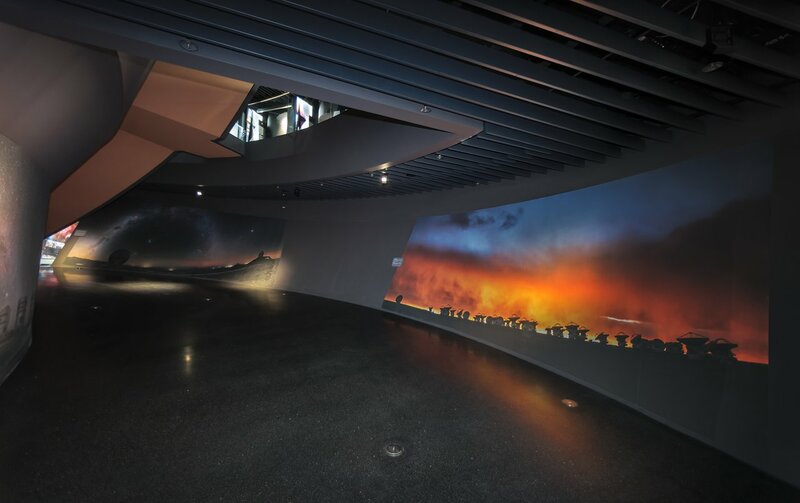 To enhance your experience in the planetarium, you can borrow a headset at the reception for a deposit of 5 euros. With the headset you can adjust the volume of the movie yourself. The headsets can also be connected directly to a cochlear implant. Please note that the headsets only work for family shows in the planetarium, and not for our educational shows. Each of our panels is equipped with a QR code. With a mobile phone and an app that can read QR codes, you can download the texts of the panel to your mobile phone which can then read them out to you with a text recognition software. Each panel explains the content in simple form in the Aha! section. Difficult words and long sentences were deliberately avoided here. The Aha! section also has a larger font to make reading the texts easier. There are lots of disabled parking spaces available near the entrance. Dogs are not allowed in the planetarium and in the exhibition for safety reasons, however trained companion dogs are an exception and are of course very welcome.